TORONTO, ON – Ontario Beverage Network reports that Von Bugle Brewing, the off-shoot of Steam Whistle Brewing that launched earlier this year, will be opening its brewery to the public today for the first time. 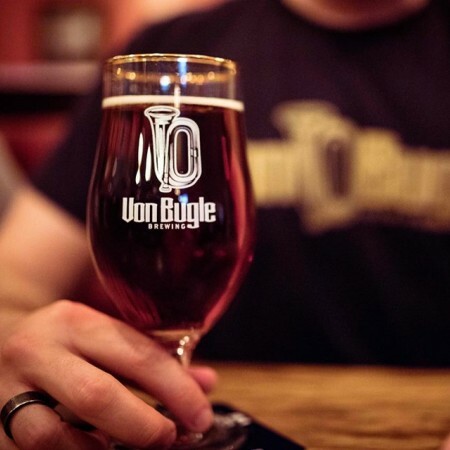 Located at 249 Evans Avenue in Toronto’s Etobicoke district, the taproom has both original and unfiltered versions of Von Bugle Munich Lager on draught, along with Steam Whistle Pilsner. The retail store currently has Steam Whistle Pilsner in bottles and cans, with a packaged version of Munich Lager to follow at a later date. Von Bugle Brewing will be open this weekend from 3:00 PM to 9:00 PM today (August 31st), 12:00 noon to 9:00 PM on Saturday, and 12:00 noon to 6:00 PM on Sunday and Monday. Regular business hours are still to be announced.